The chairman of Vietnam Logistics Business Association (VLA) has notified that local logistics firms will have to cope with tougher competition in a very near future when Vietnam opens the market wider for foreign companies as part of the country’s further regional and global integration. 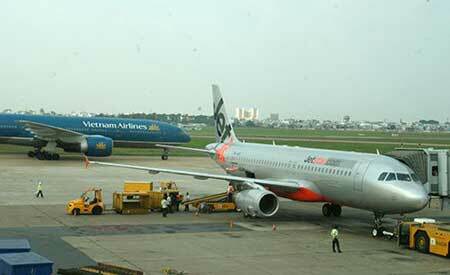 The aircraft of Vietnam Airlines and Jetstar are seen at Tan Son Nhat Airport in HCMC. VLA Chairman Do Xuan Quang says infrastructure is one of the bottlenecks that restrain logistics growth in Vietnam. Do Xuan Quang said foreign companies were currently allowed to own a maximum stake of 49% in a logistics joint venture in Vietnam but would see more chances to further explore the huge potential of this sector from next year when the country had to gradually open the market for foreign players as per its commitment to the World Trade Organization (WTO). Quang told the Daily about the major concern after the two-day Air Freight Logistics Vietnam 2013 co-hosted by VLA and the Civil Aviation Authority of Vietnam in HCMC, and ahead of a networking seminar entitled “Enterprises & Customs – Cooperation for Development” organized here next week by Vietnam Logistics Review for shippers and logistics firms. He said Vietnam’s logistics market would be opened all to foreign players in the next two years and the fact that 2015 was the target year for Vietnam and other ASEAN countries to establish the ASEAN Economic Community (AEC). “The goal of AEC is to create a common market… and from that year multinational corporations will benefit from the establishment through its subsidiaries based in Singapore and other countries in the ASEAN bloc,” he said. Quang said logistics had played an increasingly important role in Vietnam’s economy as local experts put the air freight logistics value alone at US$2 billion. The logistics sector has generated jobs for around 1.5 million people and attracted more than 1,000 companies. Over the past years, Vietnam’s logistics market has recorded an annual double-digit growth. Last year saw some 10 million TEUs go through all ports in Vietnam, including more than 400,000 tons of cargo at airports, according VLA. “These figures rose significantly compared to the year ago rate. The growth of Vietnam’s logistics market last year was lower than in 2011 but the annual rate in the past decade was 10-15%, which is higher than the average growth in other regional markets,” Quang said. The competitiveness of local logistics firms had been much improved and a number of them were able to compete on par with their foreign counterparts, Quang said. However, he voiced a number of major problems that local companies were coping with. Quang said joint ventures now accounted for a small part among over 1,000 companies participating in Vietnam’s logistics market but the cargo proportion handled by foreign players was much higher than local firms. He attributed the problem to the fact that enterprises in Vietnam often opted for the FOB model in selling their goods and importers had the right to appoint foreign ships to transport. “This is why local shippers find it very difficult to gain contracts to transport goods from the ports in HCMC, Haiphong and other parts of Vietnam,” Quang said. Though foreign wholly-own companies are not allowed in Vietnam’s logistics market, they have managed to invest in warehouses first and then engage in goods clearance procedures and other related logistics services. “Some localities have licensed foreign companies to invest in such warehouses in the absence of Vietnam’s roadmap to fulfill its commitment to the WTO,” Quang noted. Quang also pointed out the infrastructure bottleneck that restrains logistics expansion in Vietnam. He gave an example that the cargo handling capacity of Kuala Lumpur Airport in Malaysia more than tripled the combination of Noi Bai and Tan Son Nhat airports in Vietnam. Local logistics firms also have to face a slew of other issues regarding time-consuming customs clearance procedures, tax regulations, limited investment capital, high costs, technological application for governance, the quality of human resources. Quang projected logistic costs accounted for up to 20-24% of Vietnam’s gross domestic product, which nearly doubled the cost in Indonesia and Malaysia and tripled that in Singapore. Quang said all the problems had put local logistics firms in a disadvantage when competing with foreign companies once the market was opened up to players from the region and elsewhere in the world.